AutoDrive Challenge training workshop hosted by Velodyne Lidar, Inc.
SAN JOSE, Calif.--(BUSINESS WIRE)--Educational initiatives, such as the AutoDrive Challenge, enable next-generation engineers to deepen their knowledge and gain hands-on experience with autonomous vehicle technology. 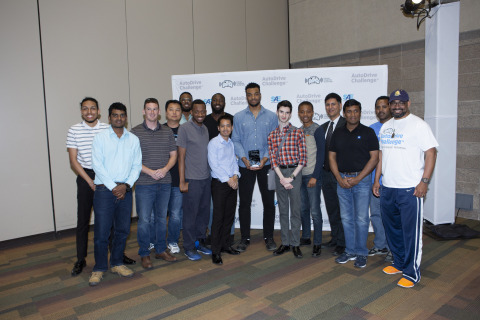 The AutoDrive Challenge, organized by General Motors and SAE International, is a three-year competition in which student engineering teams from eight university programs are tasked with developing and demonstrating a fully autonomous passenger vehicle. 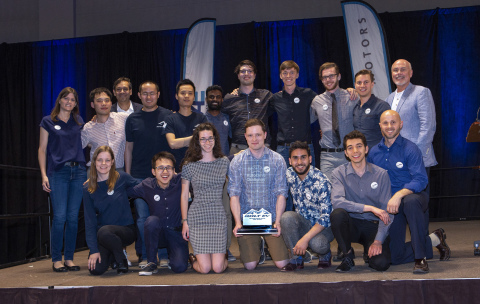 Velodyne Lidar, Inc. is a key AutoDrive Challenge sponsor and core technology provider, supplying lidar sensors to the university teams along with technical support from Velodyne engineers. To provide a glimpse into the extraordinary talent participating in the AutoDrive Challenge, Velodyne invited two students – Karreem Hogan of North Carolina A&T State University and Robert Adragna from University of Toronto – to share their backgrounds and perspectives. Curiosity is often said to be an engineer’s best asset, and that spirit of inquiry has fueled Hogan and Adragna in their engineering pursuits. “Curiosity drives me to want to know how things work so I can figure out how to make them better. With autonomous driving, how they work includes challenges from the technical implementation, the social impact, and the new laws and regulations needed to share the road with humans. Understanding these challenges will enable engineers to design better autonomous vehicles,” said Hogan. 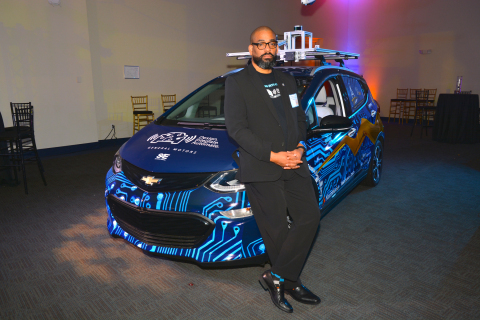 Autonomous vehicles are the latest technology to captivate Hogan, with his work as a co-captain on the North Carolina A&T team providing the subject for his dissertation as he completes a Ph.D. in electrical engineering. For Adragna, it was the combination of a high school course in theoretical physics that challenged him to understand how the world works, coupled with his passion for environmental sustainability, that provided the foundation for his interest in autonomous vehicle technology. “Autonomous cars offer a perfect mix for me. There’s the opportunity to be among the founding people involved in building a new industry and the need to engage with communities and regulators to ensure that its potential for improving the environment and safety is realized,” said Adragna. With the AutoDrive Challenge in its second year, both Hogan and Adragna said the strong bonds built within their respective teams as they work to create systems of the future have been special. 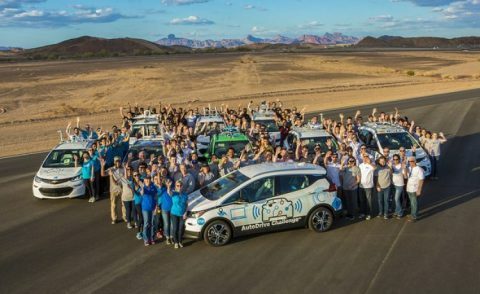 Learning about the social responsibility aspects of self-driving vehicles is an important part of the AutoDrive Challenge. Both Adragna and Hogan participated in the Velodyne-sponsored World Safety Summit on Autonomous Technology, a recent event which brought together business, government, community leaders, and the public to address the implementation of autonomous technology to increase roadway safety. Hogan’s key takeaway from the World Safety Summit was the imperative for the autonomous vehicle industry to educate the public about this new form of mobility. “The fear that comes from not knowing the technology and understanding the safety benefits that can be achieved must be addressed,” said Hogan. Hogan meets with “anyone who will listen” in the Greensboro community where North Carolina A&T is located. This outreach extends to elementary, middle, and high schools, where Hogan is frequently surprised by the questions and ideas from students. “The beauty is they don’t have the engineering constructs of what should work or not. They are unrestrained about the possibilities,” said Hogan. Velodyne provides the smartest, most powerful lidar solutions for autonomy and driver assistance. Founded in 1983 and headquartered in San Jose, Calif., Velodyne is known worldwide for its portfolio of breakthrough lidar sensor technologies. In 2005, Velodyne’s Founder and CEO, David Hall, invented real-time surround view lidar systems, revolutionizing perception and autonomy for automotive, new mobility, mapping, robotics, and security. Velodyne’s high-performance product line includes a broad range of sensing solutions, including the cost-effective Puck™, the versatile Ultra Puck™, the perfect for L4-L5 autonomy Alpha Puck™, and the directional view Velarray™. Velodyne Lidar, Inc. discusses the future of self-driving cars with next-generation engineers.